For the last month, we have been trying to do as much painting as possible done to the lower level of our house. 90% of the time is spent scraping, caulking and filling nail holes. It is amazing how much of the paint just pulls off, all 125 years of paint, down to the bare wood. 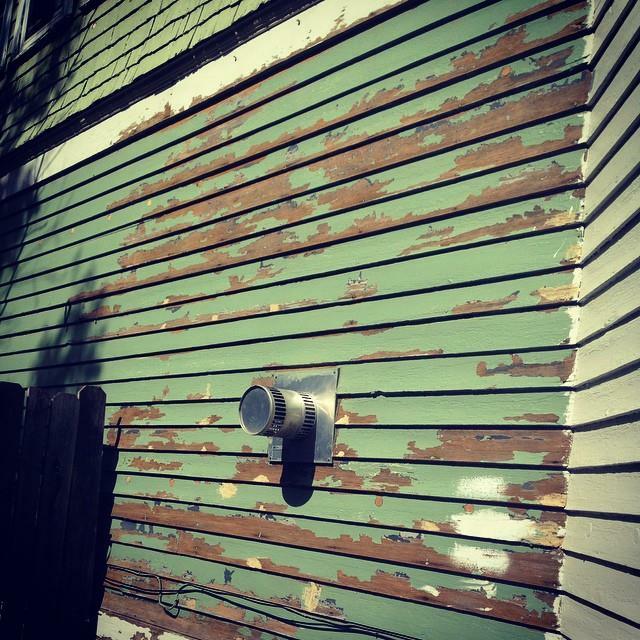 After all of that, we sand the siding, brush of the dust and then wash with TSP and then dry. And then FINALLY we can paint. It is a lot of work- like SO MUCH WORK that if I start thinking about getting the entire house painted, I get completely overwhelmed. So we are just doing a small section at a time. I love the color we have chosen (White Heron by Sherwin Williams) for the lower level. 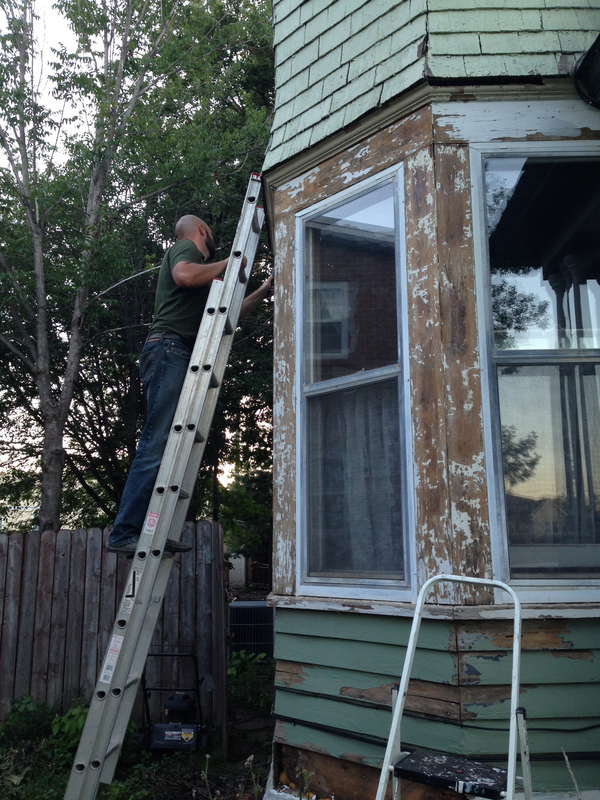 Scraping the trim around the windows of the turret. This paint was so thick and practically falling off, so we used the infrared paint removing gun to get nearly all of it off. If we hadn’t, the finish would have been really uneven. 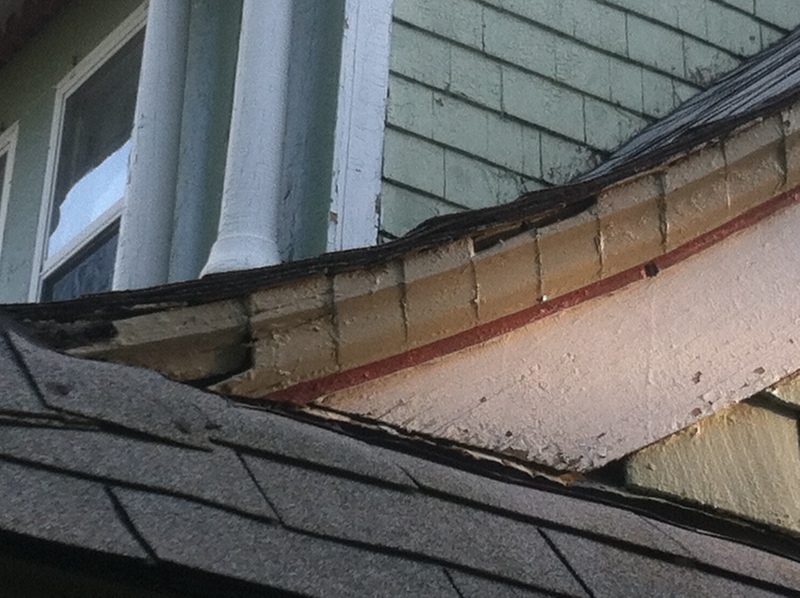 At the bottom of this photo you can see where we tore away a loose board, revealing tons of rotten wood. 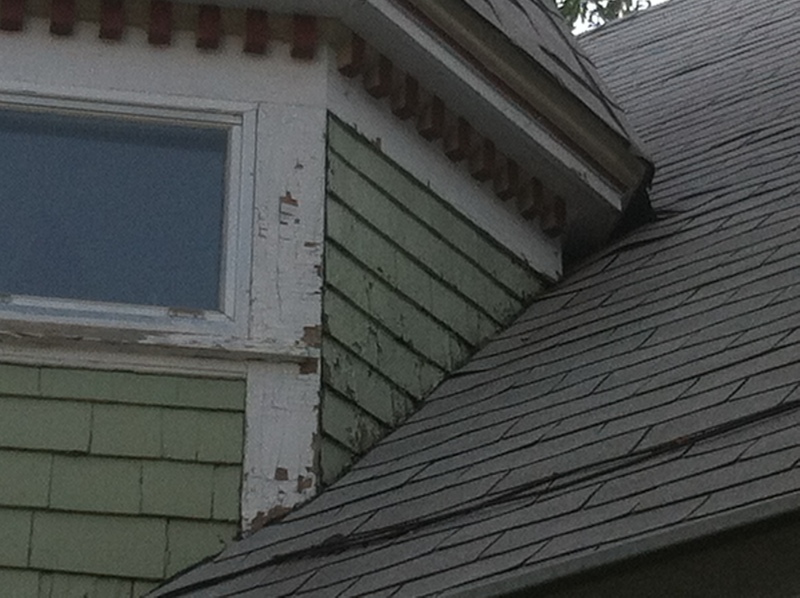 This was the same story for the other sides of the turret too, even under the siding. 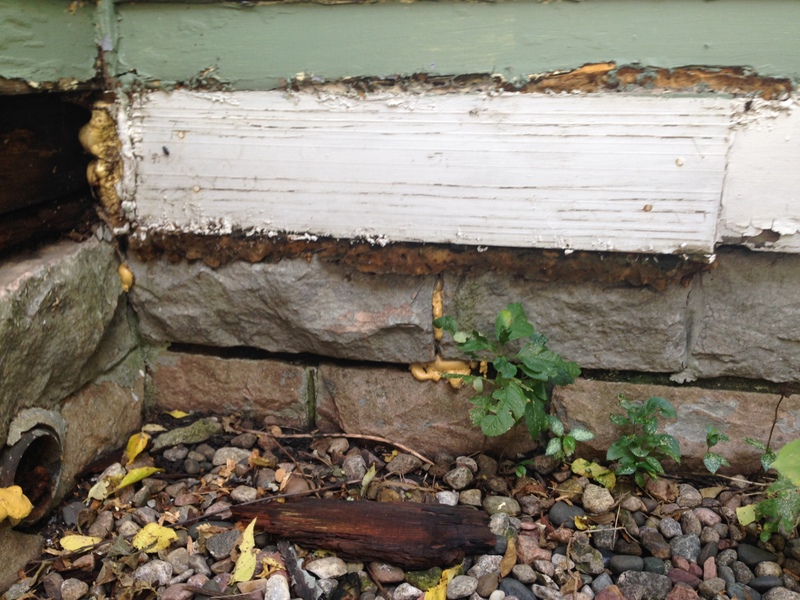 We dug out the rotten wood, used some epoxy to dry and firm it up and replaced the siding and trim pieces with new. 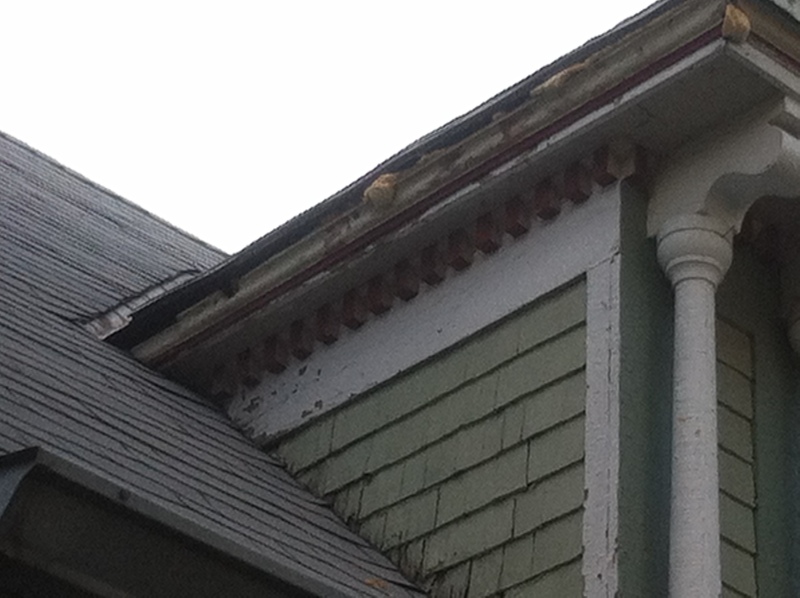 Of course, we caulked and filled every little crack that was allowing water to get inside and do the damage. A section of the South side of the house, scraped, ready for primer. 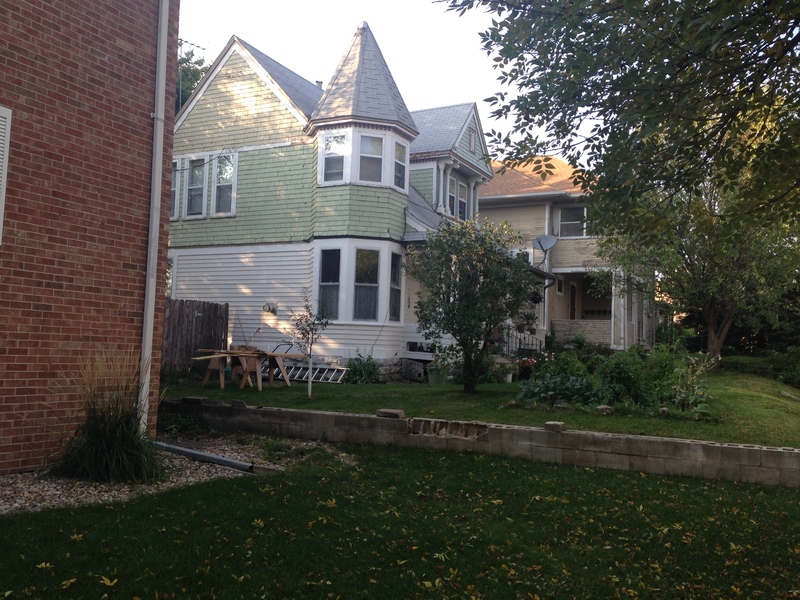 A view of the side of the house that we painted last weekend. I can’t wait to add the light grey to the shakes, but that will have to wait until next year, I’m afraid. 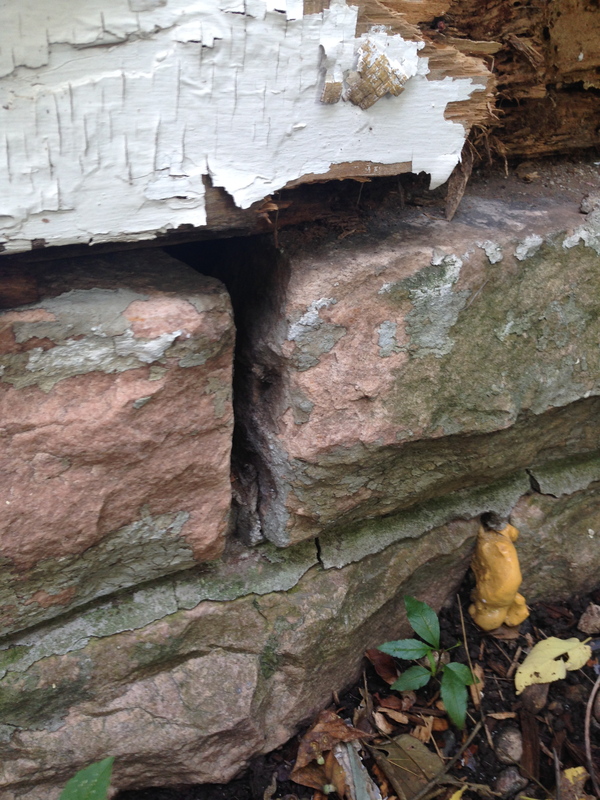 3) Have the entire foundation re-tuck-pointed. The application was due today and we should hear by January 1 if we are a recipient. We hope so! The other great thing is that the hail storm we had in June did a number on our roof, and we will be getting a new one, paid for by insurance! Hooray! This is like winning the lottery for us. 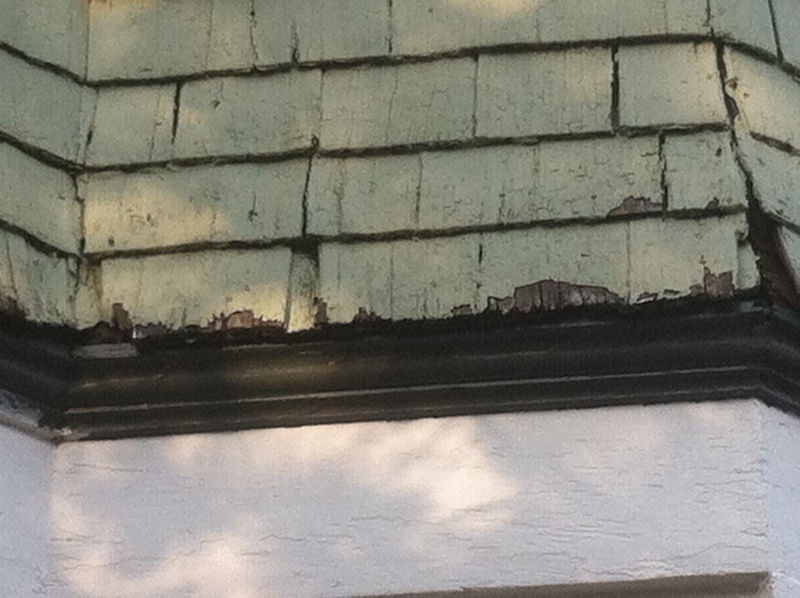 The roof is not a cheap one to re-do, due to the steep incline, but getting all of those old shingles off will help to prevent further water damage in the future. Oh and one more thing! We began the process of insulating the house last month! We now have blown-in insulation in all of the walls! It is hard to believe that for the last 125 years, there has been no insulation to help with temperature control during the brutal South Dakota winters. Amazing! Once the shingles are replaced, we will also insulate the attic, for which our energy company will reimburse 60% of the cost. We will get 20% reimbursement for the walls. A lot has been done, with even more left to do. I feel like a little squirrel– scurrying around, trying to get as much done as possible before the cold and snow put a stop to our outdoor improvement efforts. You and your husband are doing such a wonderful job on the house, so exciting to see the progress! So very happy knowing our much loved former family home is being restored to its former glory (even better than new with the updating on the insulation, painting, new roof, etc.). Thank you for sharing! Looking forward to seeing your updates in the months and years to come. I passed through Main Avenue the other day on the way to downtown and I thought it looks fantastic!